HONG KONG—Perfect weather welcomed the Helmsman races at Hebe Haven Yacht Club on Sunday Oct 5 with strong sunshine and a steady north easterly breeze. Although only 10 boats took part in this annual event when Skippers hand over their boats to the crew, it was an enjoyable and satisfying day for all of those taking part with much celebration for the winning boats. The two windward—leeward races took place in Port Shelter. The first race, starting at 12.00 noon, was for two-laps of the course finishing at the Committee Boat set upwind of the Leeward Mark. Line honours was taken by “Outrageous” who finished some 5-minutes ahead of the next boat (“Elites 99”) but “Elites 99” won on corrected time. “DEA II” and “Ichiban” finished 2nd and 3rd respectively. After a little adjustment of the markers the start gun for second race sounded 13.25 but as a variation, the race finished down-wind on the second lap. It was great to see spinnakers bulging and some of the boats picking up quite a speed. The odd motorized pleasure craft, some of them quite large, disturbed the sea and made control of the boats a little difficult at times but all starters survived the experience and finished the race. The crew of “Bits & Pieces”, picked up their game in the this second race taking line honors ahead of “Outrageous” but this time it was “DEA II” that stole the show and won the race on corrected time. “Elites 99” came 2nd and “Ichiban” finished in 3rd place. “DEA II” and “Elites 99” both finished on 3-Points for the two races but “DEA II” took the win over “Elites 99” on the ‘last race rule’. “Ichiban” was 3rd overall followed by “Outrageous”, “Bits & Pieces” and “Jacqeline Boo”. The Hong Kong Kettle starts today, Thursday Oct 9 with an ‘Around Hong Kong Islands’ Race starting at 10.30am from Victoria Harbor. The Kettle also includes races taking place off the south coast of Hong Kong Island that are part of the Audi China Coast Regatta which takes place for 3-days starting tomorrow, Friday Oct 10 to Sunday Oct 12. 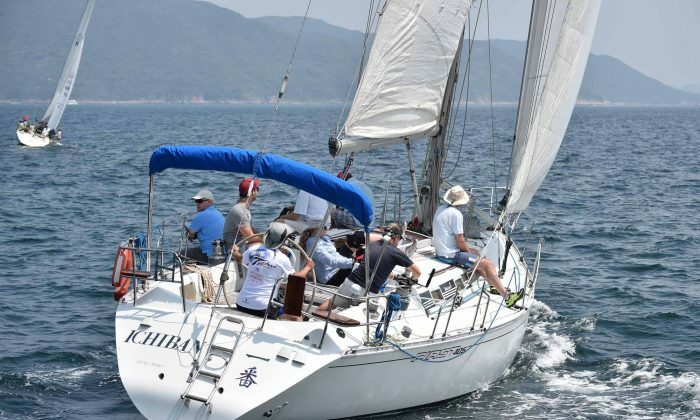 The Audi China Coast Regatta includes four categories of IRC Racers and Hong Kong Kettle Class boats; an IRC Premier Cruisers Class, an IRC Cruiser Class; and an HKPN Class. The Audi Hong Kong to Hainan Race, also part of the China Coast Regatta week, sets off from Victoria Harbor on Thursday Oct 16.